Republicans and Democrats have debates scheduled through next March as candidates on both sides seek to nail down their parties’ presidential nominations. As background, we’ve published five facts about Republicans. Here are five facts about today’s Democrats. 1 Democrats have become more liberal in recent years. The share of Democrats who describe their political views as liberal has increased over the past 15 years. In surveys conducted this year, 41% of Democrats describe themselves as liberal, 35% say they are moderates and 21% say they’re conservative. 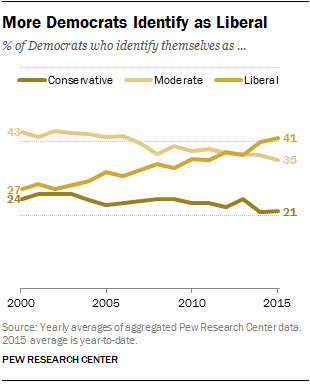 In 2000, 43% were moderate, 27% liberal and 24% conservative. 2Democrats have remained very loyal to President Barack Obama. In our September poll, Obama’s overall job rating is 46%, but Democrats are overwhelmingly supportive of the president. Fully 83% of Democrats approve of the way Obama is handling his job, compared with 43% of independents and just 9% of Republicans. At a comparable point in his presidency, George W. Bush had a lower overall job rating (31%) and lower rating among his own party (66%) than Obama does today. Bill Clinton had a higher overall job rating at a comparable point (56% in September 1999), but Clinton’s job rating among Democrats was about the same as Obama’s today (82%). 3 Democratic voters want the next president to continue Obama’s policies. In our most recent survey, 61% of possible Democratic primary voters said they would be more likely to vote for a presidential candidate who offers programs similar to the Obama administration, and 60% said they would be more likely to back a candidate who will compromise with Republicans. Smaller percentages expressed positive views about a candidate who wants to cut the size of big banks (48%), expand trade agreements (45%) or back the nuclear agreement with Iran (41%). Among possible Republican primary voters, 69% say they would be more likely to vote for a candidate who wants to end the Iran nuclear deal and 56% would be more likely to support a candidate who wants to end funding for Planned Parenthood. Partisan compromise is viewed less positively by Republican primary voters than by Democratic ones. Just 41% of possible GOP primary voters say they would be more likely to vote for a candidate who will compromise with Democrats. 4Democratic voters are ideologically divided over going after big banks. For the most part, Democrats are less ideologically divided than Republicans in their views of possible candidate positions. But among possible Democratic primary voters who are liberal, 60% say they would be more likely to vote for a candidate who wants to reduce the size of large banks and financial institutions; just 38% of moderate and conservative Democratic voters say the same. 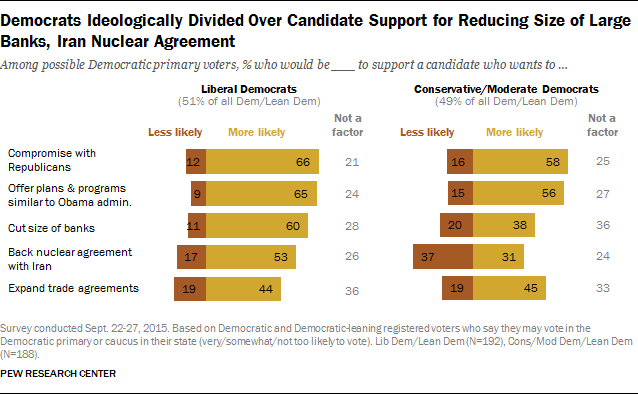 Liberal Democratic voters also are far more likely than conservatives or moderates to express a positive view of a candidate who backs the Iran nuclear deal (53% vs. 31%). But comparable percentages of liberals (44%) and conservatives and moderates (45%) say they would be more likely to vote for a candidate who wants to expand trade agreements. Hillary Clinton recently announced she does not support the Trans-Pacific Partnership, a trade pact negotiated by the Obama administration with a dozen Pacific nations. Clinton’s main rival, Sen. Bernie Sanders of Vermont, also opposes the TPP. 5 Democratic voters are also divided on whether it’s more important for a presidential candidate to have “experience” or “new ideas.” Among all possible Democratic primary voters, 53% say it is more important for a presidential candidate to have “experience and a proven record”; 39% say it is more important for a candidate to have “new ideas and a different approach.” By contrast, 66% of possible GOP primary voters prioritize news ideas and a different approach. Just 29% say it is more important that a candidate have experience and proven record. Democratic voters who value experience have very different candidate preferences than do the smaller share who prioritize new ideas. In an open-ended question, most Democratic voters (56%) who see experience as more important name Clinton as their first choice for the Democratic nomination. By contrast, Democrats who cite new ideas as more important are divided, with 33% naming Clinton and 35% choosing Sanders.